Expert All-Mountain skis are designed for proficient skiers who like to rip groomers, float through powder and slash through the trees. Their amplified performance and all-terrain arrogance allow riders to push in all conditions and fully experience the mountain with a hard-charging attitude. Their functional versatility defines the rules of how you’re supposed to play outdoors. Some of the skis in this category have limits, while others continue to squeeze the unexplored capabilities resting beneath your insole. When you’re hot, you’re hot…so buckle up and let ’er rip. Our test team skiers consistently challenge the boundaries of this class to uncover your perfect match for an all-mountain experience. There’s no one ski that’s perfect for every skier. There’s not even one perfect ski in any one category. That’s why Ski Canada doesn’t bestow awards and declare “winners.” Instead, we break our ski reviews into categories and then for each ski, highlight what kind of skier each ski will appeal to best. 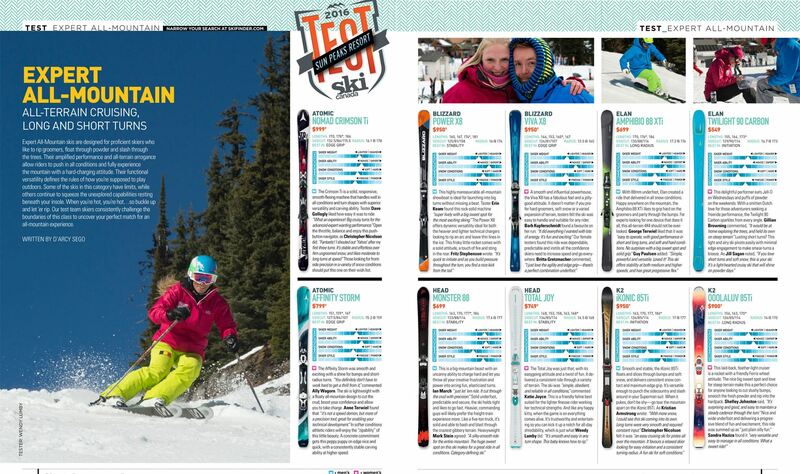 To help you match yourself to those two variables, read the descriptions of the different ski categories: What kind of ski do you need? Check out our graphic: What kind of skier are YOU? Next, check out the profiles of our Test Team and match yourself to ones most like you. 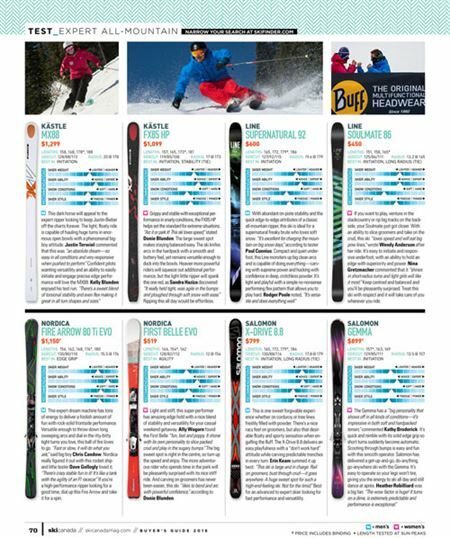 Their favourite skis in each category are listed under their bios. Once you’ve done all that, also try out our app and online tool SkiFinder at skifinder.com to rank test skis based on your personal skiing characteristics. 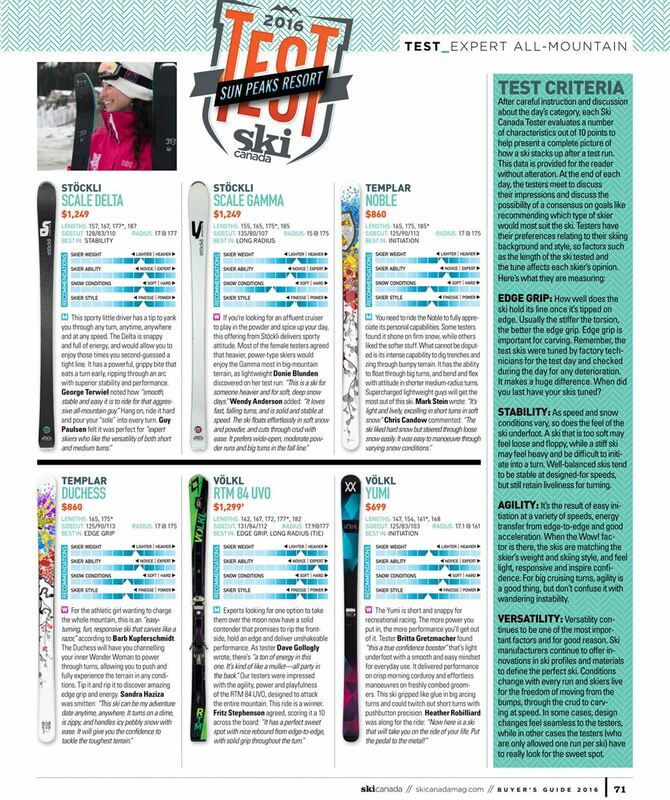 All test skis are scored using the following criteria: Edge Grip, Stability, Agility and Versatility. Read more: skicanadamag.com/test. FIND SKIS using Ski Canada’s interactive ski test tool – SkiFinder. Also available as a free app from the iStore for iPhone & Google Play for Android. MEN: The Crimson Ti is a solid, responsive, smooth-flexing machine that handles well in all conditions and turn shapes with superior versatility and carving ability. Tester Dave Gollogly liked how easy it was to ride: “What an experience! Big cruisy turns for the advanced-expert wanting performance.” Open the throttle, balance and enjoy this push-button navigator, as Christopher Nicolson did: “Fantastic! I shouted out ‘Yahoo’ after my first three turns. It’s stable and effortless over firm ungroomed snow, and likes moderate to long turns at speed.” Those looking for frontside precision in a variety of snow conditions should put this one on their wish list. WOMEN: The Affinity Storm was smooth and exciting with a shine for bumps and short-radius turns. “You definitely don’t have to work hard to get a thrill from it,” commented Ally Wagorn. The ski is lightweight with a floaty all-mountain design to cut the crud, boost your confidence and allow you to take charge. Anne Terwiel found that “it’s not a speed demon, but more of a precision tool; great for enabling your technical development.” In softer conditions athletic riders will enjoy the “zipability” of this little beauty. A concrete commitment gets this peppy puppy on edge nice and quick, with a consistently stable carving ability at higher speed. WOMEN: Grippy and stable with exceptional performance in snarly conditions, the FX85 HP helps set the standard for extreme situations. “Arc it or park it! This ski loves speed,” statedDonie Blunden. The large sweet spot makes staying balanced easy. The ski knifes arcs in the hardpack with a smooth and buttery feel, yet remains versatile enough to duck into the bowls. Heavier more powerful riders will squeeze out additional performance, but the light little ripper will spank this one red, as Sandra Haziza discovered: “It really held tight, was agile in the bumps and ploughed through soft snow with ease.” Ripping this all day would be effortless. WOMEN: If you want to play, venture in the slackcountry or rip big tracks on the backside, your Soulmate just got closer. With an ability to slice groomers and take on the crud, this ski “loves speed and will eat big pow lines,” wrote Wendy Anderson after her ride. It’s easy to initiate and responsive underfoot, with an ability to hold an edge with superiority and power. Nina Gretzmacher commented that it “shines in short-radius turns and light girls will like it most.” Keep centred and balanced and you’ll be pleasantly surprised. Treat this ski with respect and it will take care of you wherever you ride. MEN: This expert dream machine has tons of energy to deliver a foolish amount of fun with rock-solid frontside performance. Versatile enough to throw down long sweeping arcs and dial-in the itty-bitty tight turns you love, this ball of fire loves to go. “Fast or slow, it will do what you ask,” said big boy Chris Candow. 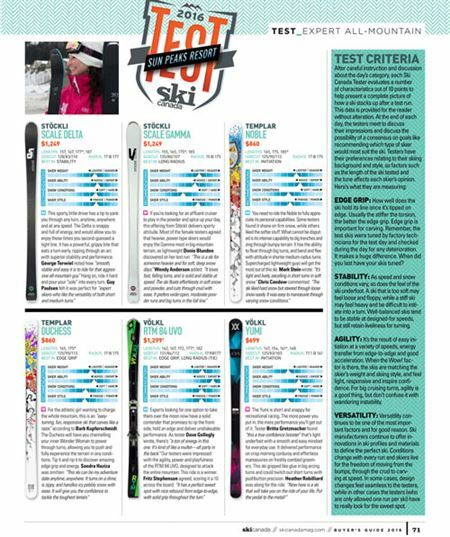 Nordica really figured it out with this rocket ship and lithe tester Dave Gollogly loved it: “There’s crazy stable fun in it! It’s like a tank with the agility of an F1 racecar.” If you’re a high-performance ripper looking for a good time, dial up this Fire Arrow and take it for a spin. WOMEN: Light and stiff, this super-performer has amazing edge hold with a nice blend of stability and versatility for your casual weekend getaway. Ally Wagorn found the First Belle “fun, fast and poppy. It shone with its own personality to slice packed crud and play in the sugary bumps.” The big sweet spot is right in the centre, so turn up the speed and enjoy. The more adventurous rider who spends time in the park will be pleasantly surprised with its nice stiff ride. And carving on groomers has never been easier; this ski “likes to bend and arc with powerful confidence,” according to Donie Blunden. MEN: This is one sweet forgivable experience whether on corduroy or tree lines freshly filled with powder. There’s a nice racy feel on groomers, but also that desirable floaty and sporty sensation when engulfing the fluff. The X-Drive 8.8 delivers an easy playfulness with a “don’t work hard” attitude while carving predictable trenches in every turn. Erin Keam summed it up best: “This ski is large and in charge. Rail on groomers, bust through crud—it goes anywhere. A huge sweet spot for such a high-end-feeling ski. 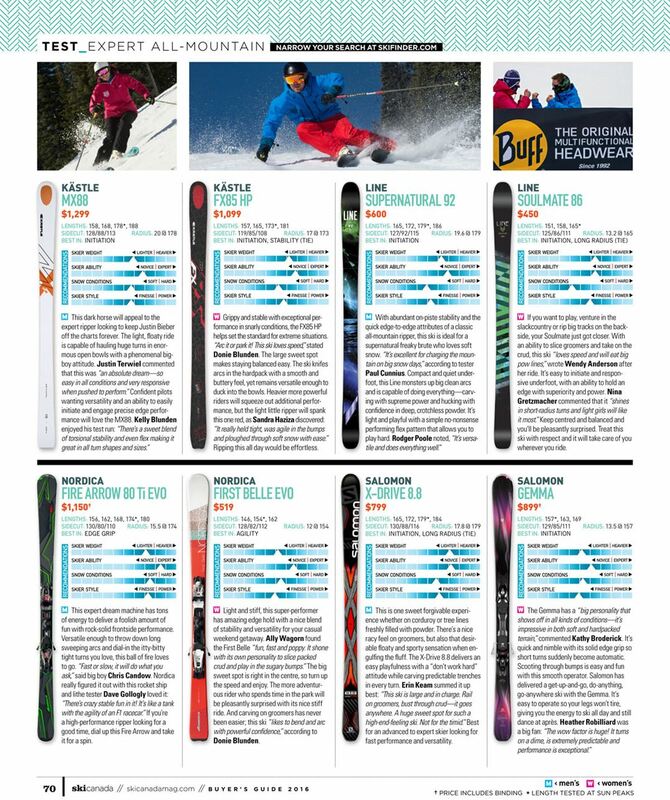 Not for the timid.” Best for an advanced to expert skier looking for fast performance and versatility.